Nvidia's Tegra 3, Samsung's Eynos 4412 (along with their 5250 chipset), and Huawei's K3V2 chipsets have been the most commonly talked about processors in the past weeks, and the battle to get as much power packed into a phone/tablet is off to a good start in 2012. But there's another chipset maker that's also looking to get their hardware into our little green Andy, which would actually demo the worlds first Android powered smartphone running this particular architecture. We haven't heard much from them in terms of mobile devices, but that certainly doesn't make them a stranger to the game. In fact, it's quite the opposite, as Intel, the worlds largest and highest valued semiconductor chip maker in the world, will feature their chip in the first Intel powered Android smartphone in just 3 days from now. 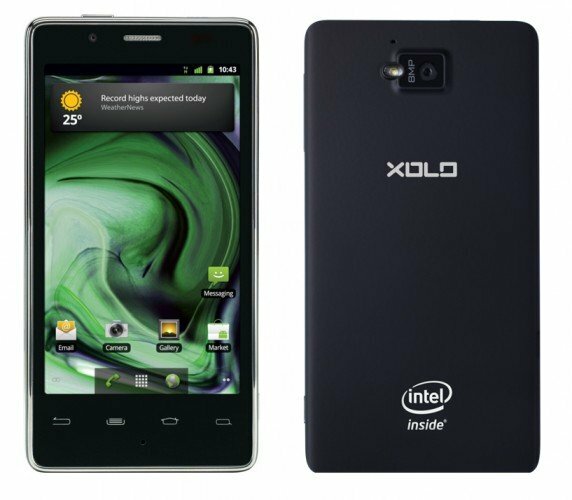 The device is called the Lava Xolo X900 (Lava is the company producing the phone, and are an India based cell phone maker), and will be running Android Gingerbread (why?) on Intels Medfield architecture. It's based on Intel's 1.6GHz Atom Z2460, has a 4.03 inch LCD screen with 1024 x 600 resolution, and will be released with a 424 dollar pricetag for the Indian Market. It also sports an 8 megapixel camera, and it's said that it will see an update to Android Ice Cream Sandwich "shortly“ (uh oh). In terms of additional hardware, the Intel powered device has a standard micro USB slot along with a micro HDMI, a 1.3 MP front facing camera, stereo speakers, 2 microphones, 16 gigs of internal storage, and 1GB of RAM. Well......ok why not! I mean no, it's not anything that makes us drool, especially when you compare it to current high end Android devices like the HTC One X or the upcoming Samsung Galaxy S3. But that being said, this is a big advancement for Intel, as it has taken them several years to finally release a chip suitable for mobile devices. The X900 will be available for purchase in India on Monday, April 23rd, and we'll update this article when we recieve any news in regards to a North American or European release. Nice to see you here as well as on the forums! I guess we'll need to get our hands on it first before we can confirm that. I will add these details to the blog. No word yet on when it will come to the US and EU. Who makes the phone itself? Intel? I don't see where you mention the phone manufacturer. Any plans for an US release? Oh.. and is this a single core chip? Yeah...because when I write about an Intel phone being released, and mention HTC, Nvida, Tegra3, Huawei, and Samsung, it makes it abundantly clear that this is indeed a Samsung only website.